The only thing better than the perfect cup of coffee is the perfect cup of coffee complete with a whimsical design etched into the foam. 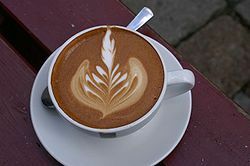 Latte art is tricky and requires a bit of practice, but it is almost guaranteed to bring a smile to the consumers face. To get perfect art every time, you will require the right tools for the job. A coffee maker, or a milk frother at the very least, is essential. It is impossible to create quality latte art without frothed milk. The next important thing is to get both the coffee and the frothed milk just right. The coffee should have a dark, rich texture and should be thick enough to support the milk. The froth should also be thick, but not too thick. The biggest mistake that beginners make is frothing the milk for too long, so that it turns out dry and frothy. The easiest way to create coffee art is to use templates. This requires little skill but still provides an impressive result. Once you've made your coffee, place the stencil above your mug and dust cinnamon or chocolate dust over the lot (see here for an example). The second method involves pouring and swirling your milk in a way that creates a picture. Two of the most common patterns are the love heart and the rosette (see picture). A heart is very simple and a good design to practice with. To draw a heart, simply move your hand backwards and forwards as you slowly pour the milk from the pitcher. For a rosette, pour the milk in a similar fashion but move the pitcher up and down across the cup. While this sounds simple, it takes a lot of practice to get the timing right. For professional coffee art lessons, as well as tips on how to brew the perfect cup, book yourself into coffee school. Try Australian Barista School or Coffee School for classes in Australia.